The nominations for the 2012 Emmy Awards will be announced early Thursday morning, inevitably starting two months of bemoaning the snubs and pontificating on the winners. But until the names are read aloud by Kerry Washington and Nick Offerman, the world is our oyster and we can remain hopeful that our favorites will make the cut. Like last year, I'm leading up to the nomination announcements with my list of dream nominees, starting with the men. You won't find the likes of Jim Parsons, Aaron Paul or Bryan Cranston on this list—those guys are shoe-ins and will undoubtedly be frontrunners in their categories. No, these are the actors that I fear will be tragically overlooked by the Academy despite delivering some of the best performances on television this year. You'll notice that, once again, most of these men are eligible for the Outstanding Supporting Actor in a Comedy Series. For the third year in a row, all of the Modern Family actors have submitted themselves in supporting categories, and while Ty Burrell and Ed O'Neill would likely be frontrunners in the lead category, their inclusion here means many of our favorites don't stand a chance. Like last year, this is truly a dream nomination since voice actors are not eligible for categories like Outstanding Lead Actor in a Comedy Series. But for anyone who has seen even a clip of Archer, it's obvious that Benjamin deserves the recognition. The suave-yet-incredibly-daft qualities we love about Sterling Archer all come from him, whether it's his surprising seduction of Pam or his fanboy antics around his mother's new boyfriend Burt Reynolds. I've said it before and I'll say it again, if Family Guy can get a nomination for Outstanding Comedy Series, why can't these fine voice actors get mainstream recognition, too?! 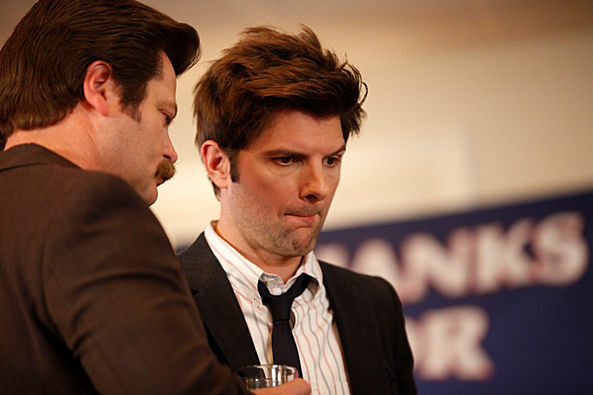 Throughout Season 3 of Parks and Rec, Ben Wyatt transformed from antagonist to love interest for Leslie Knope. And in Season 4, he became one of the driving forces of the show. Though often the foil for Leslie's antics, Adam Scott found a lot of time to shine this season in both his romance with Amy Poehler—think episodes like "Win, Lose, or Draw" and "Smallest Park"—and in purely comedic moments like his Batman costume reveal or the entire Model UN conference in "The Treaty." I might not have recommended him for an Emmy in 2011, but I think 2012 is his year. Last year, I singled out Kyle Bornheimer as my favorite actor from Perfect Couples, one of the tragically short-lived NBC sitcoms of 2011. This year, I'm highlighting his former castmate David Walton of Bent, one of the tragically short-lived NBC sitcoms of 2012. Walton consistently brought an endearing, charming quality to contractor Pete while still being incredibly funny. It's a shame NBC burned off the six episodes and cut our time with Walton off so quickly. I have a feeling that if anyone is going to break into the Supporting Actor in a Comedy category, it's Max Greenfield. Not only is he on one of the most buzz-worthy new shows of the year, but he's damn good in it. Good enough, in fact, to make us realize that there's more to this show than the "adorkability" of Zooey Deschanel. Through douche jars, kimonos and a secret affair with Cece, Greenfield was the MVP of the freshman series. Finally breaking free from Buster Bluth, Tony Hale was magnificent in the first season of HBO's Veep as Gary, the personal aide to the Vice President. Those his antics were always a highlight of the series, his performance in "Baseball" is pure comedy gold, from trying to "man up" for his dad to getting the remains of a pregnancy test spilled all over him. It's likely that Julia Louis-Dreyfus will be the sole nominee from the new series, but Hale deserves it just as much. This is an obvious inclusion on the list, but until the day it happens, Nick Offerman will always get a shout out from me when it comes to the upcoming Emmy nominations. Ron Swanson is an iconic television character and Offerman continues to prove his genius in the role. With Offerman announcing the nominations this year, now is the perfect time for the Academy to finally get it right. Last year, I suggested that Happy Endings' late premiere and short episode order wouldn't spell Emmy success for Adam Pally, a.k.a. the lovable, lazy oaf Max. Luckily, the show exploded in its sophomore season and Pally was often in the center of the discussion. His relationship with Grant allowed him to show a softer side of Max, while his baby costume in the Halloween episode was one of the absolute funniest gags of the past year. At this point, Community's chances for a nomination are about as likely as Snooki's chance of being elected President. That being said, Jim Rash is now Oscar-winner Jim Rash (he co-wrote The Descendants) and that might help create some momentum amongst The Academy. Oscar or no Oscar, though, Dean Pelton continued to be one of my favorite parts of the series, and his promotion to series regular this season meant a lot more Dean time. Plus, I don't know if anyone on TV has a better Emmy submission episode than Jim Rash has with "Documentary Filmmaking: Redux." Okay, okay. Remember when I just said that Jim Rash had the best Emmy submission episode? Well, fine. Peter Dinklage may just eek by him. One word: Blackwater. His rousing speech to the troops of King's Landing was some of his best work on the show, not to mention his quiet moments with Shae. It's worth mentioning that, even as a defending champion in this category, Dinklage faces an uphill battle because Game of Thrones is a fantasy genre shows and Lord knows the Academy does not care for genre shows. I'm sure he's in, but I'll take any chance I can get to applaud Tyrion Lannister. And, of course, I have to close things out by highlight the man with the most balls out of any man on TV, even if they are often tucked: RuPaul. As host, mentor and judge on RuPaul's Drag Race, Ru consistently gives the likes of Seacrest and Keoghan a run for their money. No one cares more about the contestants or inspires the audience more than she does, and it's about damn time the Academy wised up and gave RuPaul an Emmy! I'll be back with my dream list of Emmy ladies, but in the meantime: who do you hope gets nominated on Thursday? Do you think anyone on my list has a chance for a nod? Sound off in the comments!